When searching for ice baths for sale, it’s doubtful that one of the first things that springs to mind is colour. It’s unlikely that you would entertain the thought that you could select an ice bath which is available in your preferential colour because it’s not something that you’ve come across before. But here at Pride on the Line we like to step out of the box and create our own set of rules when it comes to delivering unique and innovative ice bath solutions. Ice bath designs which have the capacity to provide superior recovery output, are kitted out with numerous safety features and have the capacity to accommodate numerous athletes at any given time were hugely important factors in the development of the Pride on the Line ice baths. 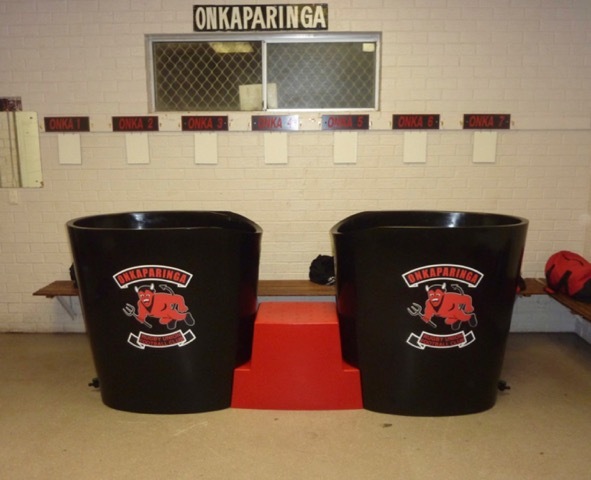 However, at a time when personalisation is becoming increasingly popular and people are searching for a point of difference and uniqueness wherever possible, there was a strong desire to add another element to the ice baths so that users could feel a little more at home in their environment. Hence the introduction of colour. So what does a simple colour represent? The obvious answer is that a colour is a representation of your club, your team or your brand perhaps. The colour appears on logos, jerseys and merchandise for example and resonates not only with the team but also with supporter bases also. If we look a little deeper, we can see where the root of the colour selection lies and why it was chosen in the first instance. Red for instance represents power and strength, blue displays loyalty and purple brings with it ambition, for instance. So, we would argue that a “colour isn’t just a colour” but rather a representation of who you are as an individual or a team. 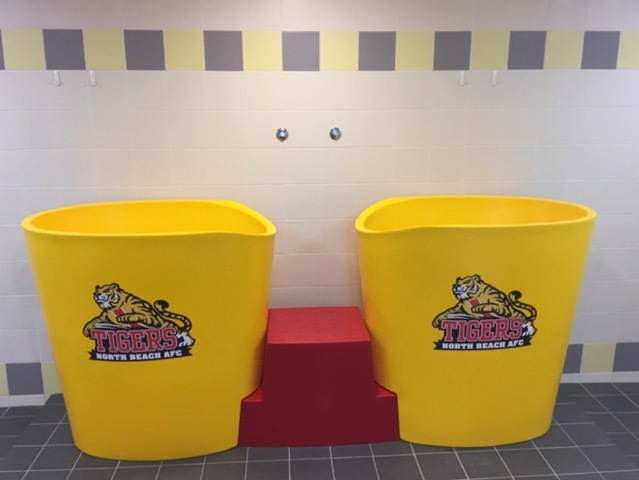 Clubs at all levels of sport are innately proud groups and given the opportunity to customise their ice bath by selecting any of the 12 colour options they have to choose from, they eagerly jump at the chance. Just as they are passionate about their own colours they are at times just as passionate about not having a rival colour in their change room and so the option to customise is again, a very appealing option. So now, if you’re looking for an ice bath for sale you’re aware that the Pride on the Line Recovery Baths provide colour options, however what you may not be aware of is that they also provide logo branding. This feature allows you to supply and display a logo or logos of your choosing which are applied to the two front surfaces of the Duo and the front and rear surface of the Compact ice bath. Combined with the colour options, this enables the users to create unique and one off ice baths each and every time. Although a charcoal grey step is provided with each Duo as standard, we do provide the option to customise this also so that each of the three pieces which form the Duo ice bath are uniquely coloured. The Onkaparinga Rugby Union Football Club were a perfect example of precisely this. The club colours are red and black so the indication was that either of these colours would be suitable for the two Duo ice bath tubs. A quick look at the club logo and in became obvious that either red tubs with a black step or black tubs with a red step would provide the perfect combination. Mock-up computerised images were created and supplied to the club showing both of these options along with the application of logo branding. The final decision was then made by the club and the end result was as per the image below. Similarly, the North Beach Amateur Football Club whose club colours are red and yellow, were seeking a Duo ice bath which incorporated and complemented their club colours. As a result Pride on the Line were able to supple a Duo which consisted with two yellow tubs complete with a red step and logo branding as per the image below. There are numerous other examples and obviously too many to list but a quick visit to the Pride on the Line Gallery page at www.prideontheline.com/gallery will give you a better understanding of the outcomes that are able to be achieved. We understand that the opportunity to incorporate colours and logos may not be for everyone but we have found that it is a likeable option for many and the process of watching a ice bath be created from a conceptual stage to a final end product phase is a fun and enjoyable process for many.